UPDATE: August 17, 2018. Since the publication of this article, Mr. De Montfort has been in touch with us to clarify several points about the company’s approach and policies. This new information is annotated in the text below. We’ve seen quite a bit of media buzz recently about a new startup, De Montfort Literature (DML). DML’s novel venture — if you’ll excuse the pun — promises to select writers algorithmically, and pay selected writers a £24,000 annual salary (about $31,000 USD) while they write their books and cultivate their talent. To an aspiring or fledgling author, this sounds like a dream come true. The goal of many professional authors is to earn a living wage from their writing, a goal that requires years of hard work, patience, and a bit of luck. Then along comes a wealthy investor offering to finance a full-time writing career. The rate is slightly lower than the average full time salary (£27,600) but it skips the slow climb that most authors face and allows them to jump straight into a full-time career as an author. But, as always, the devil is in the details. In this analysis, we’ll examine the pitfalls of this new company with an unflinching eye. Jonathan De Montfort, the individual behind this venture, is a successful hedge fund manager who credits his firm’s success to “a mathematical system based partly on the Fibonacci sequence”. He claims this system has successfully predicted financial markets, the 2008 crash, and Brexit, and other events, and now believes it can be applied to literature. “I have taken what I know about hedge fund management and applied it to literature,” reads a quote on the company’s website. However, De Montfort’s experience with publishing appears to be extremely limited; his first novel, Turner is scheduled to be published on August 31st of this year. The thousands of career authors who are earning a living wage from their “invalid career choice” may take exception to those comments. DML’s website also stresses that they are open to any genre. A one-size-fits-all approach does not work for all books. Does the company have the expertise and understanding of the market to sell books across a wide range of genres? De Montfort may believe his venture to be an innovative new approach (or, as his website puts it, “a totally new model” and “a game changer for the fiction industry”). But startups regularly arrive on the publishing scene promising to revolutionize an industry they have minimal experience with, and the results are rarely good. Consider Inkitt, who debuted with similar Jedi hand-waves and claims of “an algorithm that predicts bestsellers by analyzing reading behaviour”. The founders’ experience in sales and software development did not translate to experience in publishing. Disastrous contract terms underscored the company’s poor understanding of the industry, while aggressive spam campaigns led to their being banned from multiple social media platforms. Inkitt’s ham-fisted tactics swiftly raised the ire of industry watchdogs and prominent authors. Publishing is a turbulent sea, and those entrepreneurs who leap in without understanding the depths of those waters often drown. Sadly, they may drag scores of novice authors down with them. While the fine points of DML’s contract are unknown at this point, the points that have been publicly disclosed are hugely problematic. Several of these terms are particularly odious in a publishing contract. Non-compete clauses have the potential to cripple an author’s career and income. Sweeping rights grabs deprive authors of assets that are potentially far more valuable than the original work. And even if it’s enforceable in your jurisdiction, claiming ownership of an author’s ideas should be an immediate deal breaker for any publishing contract. UPDATE: The terms of the contract are being revised, and the two-year non-compete clause is being reduced substantially (to a matter of weeks). Additionally, this period will be compensated as paid leave. According to Mr. de Montfort, the ownership of ideas is limited to the characters and plots mutually agreed to by both parties; it is not a sweeping claim to any ideas the author may come up with during their term at DML. Technically, the author retains ownership of the copyright, but licenses the content and all rights, subrights, and options exclusively to DML unless the author chooses to buy back those rights. DML states in its FAQ that “We are looking to promote you as an authorial brand.” However, that authorial brand is under the exclusive control of DML for years. The company claims ownership over your writing and the very ideas of your books, and has the right to hire less qualified authors to churn out content with your name on it long after you’ve left the company. But, if you wish, you may buy back the rights to your creativity and your name for an undisclosed sum. UPDATE: Mr. de Montfort says the buyback of rights is formulaic, calibrated on a curve that’s based on the author’s sales, and designed to protect DML’s investment in the author. What’s fifty percent of nothing? UPDATE: Author royalties will increase based on the author’s sales. There’s a phrase to describe the kind of open-ended costs DML lists above: Hollywood accounting. The television and movie industry is infamous for using creative accounting methods to inflate the recorded costs of a project in order to downplay profits. For example, Harry Potter and the Order of the Phoenix earned $940 million at the box office on a $150 million budget. Yet, on paper, Warner Bros. claimed that the film resulted in a $169 million loss. The studio claimed distribution fees of $212 million which the studio paid to — surprise, surprise — its own subsidiaries. By claiming a loss in this way, studios can minimize their taxes and reduce royalties to a fraction of their actual value. Hollywood accounting is why authors must be extremely wary of royalties based on net profits, or a percentage of profits after expenses. It’s all too easy — and perfectly legal — for a publisher to claim tens of thousands of dollars in marketing expenses, salaries, and other fees paid to entities under their control. If you’re being paid a percentage of net after costs, this creative accounting cuts deeply into your income. We haven’t seen the state of DML’s accounting yet, but the cynic in me notes that a hedge fund manager whose raison d’être is amassing wealth will almost certainly be looking to maximize profits. UPDATE: Mr. de Montfort states that all costs — including salaries — will be disclosed to the author up front. De Montfort assures us that DML is born out of a desire to elevate authors, and to invest in their future. But no matter how benign those intentions may be, framing authors as salaried employees opens the door to dangerous, even dystopian possibilities. I do not relish a scenario in which authors are simply human resources to be hired and fired at the whim of an algorithm, where creativity is subject to quotas and mandatory targets, and most importantly, where the newfound independence and agency of authors is sacrificed for the promise of a paycheck. DML does not specify how many books an author will be expected to pen, stating only that the number “depends on the author and their ideas”, and that they will be “expected to hit certain targets”. What are those targets? 2,000 words per day? 10,000? 15,000? We just don’t know. UPDATE: Mr. de Montfort says author targets are agreed upon in advance, and tailored to the author. DML offers to pay for the author’s legal fees to assess the fairness of the contract, as well as membership in the Society of Authors. And therein lies the primary concern with DML’s contract and business model. It requires the author to have faith in de Montfort Literature’s good intentions, yet enables a raft of potential exploitation. It may yet turn out that DML is an incredible boon to authors, and that De Montfort’s good intentions are backed by good faith actions. Money does flow toward the author under this system, but as it stands, the potential harm inflicted by the restrictive terms of DML’s employment offset the benefit of a steady paycheck. Good intentions are commendable, only a well-crafted contract that protects the interests of both parties will save authors from being exploited. The author passes DML’s screening and is accepted into the program. The author quits their day job to pursue their passion, writing. The author collects a steady paycheck. DML allows them to write what they want, without restriction. The company assigns modest goals, and supports the author in reaching them. The author does not have to worry about editing, marketing, distribution, or any of the minutiae of publishing. The company proves to be skilled at marketing books of all genres, and generates exceptional sales. The company deducts minimal costs from the author’s royalties. Profits are excellent. The author is happy, flush with cash, and remains with DML to grow their author brand. DML’s algorithms decide that steamy vampire detective thrillers have high profit potential. DML assigns the author a steamy vampire detective thriller project very loosely based on the author’s original historical romance idea. DML requires six steamy vampire detective novels per year. Writer’s block is not allowed. The author has an idea for a fascinating book on a topic that has captivated their interest. DML declines to pursue the project. The idea now belongs to DML, and the writer is prohibited from authoring similar works. Although the author is entitled to 50% of the steamy vampire net profits, DML claims that marketing, production, and salaries have resulted in a net loss. The author quits in disgust… or DML informs the author that they are no longer needed and dismisses them. DML retains the rights to use the author’s name, branding, ideas, and books. The author is prohibited from writing or publishing anything for two years. Meanwhile, DML markets a series of horrendous steamy vampire detective thriller under the author’s name, ghostwritten by an overworked amateur. When the author asks DML to stop, the company invites the author to buy back the rights to their intellectual property for $20,000.00. Which scenario will be closer to the truth? We’ll have to wait and see, but I would not want to be the guinea pig for this experiment. De Montfort Literature did not respond to our request for comment before the article’s publication. De Montfort stresses that the exclusive licensing and buyback provisions are only in place to protect DML’s investment in the author. The goal of DML is to cultivate storytellers and develop their skills and branding. But, to help guide the author, the author must surrender some control. “We are their total management agent,” he says. When asked whether the company would continue to publish books under the author’s name after they leave DML, de Montfort pointed out that the company only has rights to the stories the author has licensed to DML. Authors record their ideas and pitch them in an interview, and if DML accepts the proposal, the defined plotlines are licensed exclusively to the company, under terms that are clear to the author and mutually agreed upon. In this Watchdog’s view, Jonathan de Montfort is flush with good intentions and exhibits a genuine passion for literature. However, the direction DML takes in its evolving strategy remains to be seen. The company may yet shed some of the more onerous terms in its business model, establishing itself as a fair and equitable option for authors seeking traditional publication, and an incubator for rising talent. But it could just as easily descend into exploitation and abuse, particularly if the company changes hands or adopts a more mercenary stance. We’ll be watching closely to see which path this unusual venture takes. 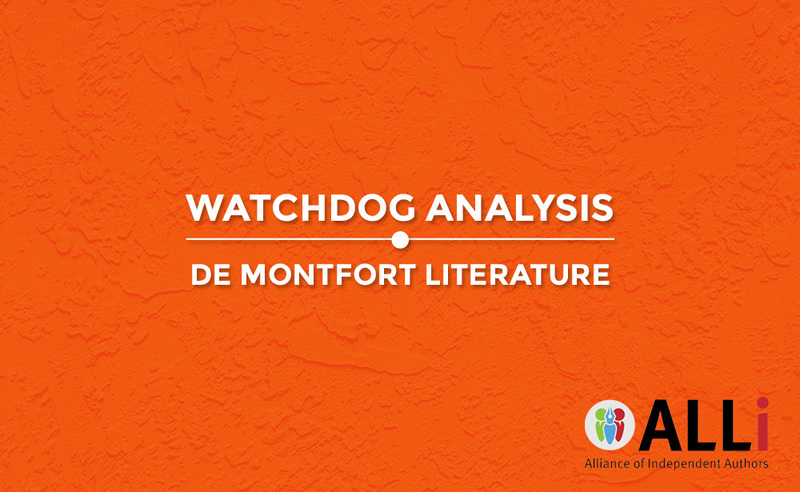 What are your thoughts on De Montfort Literature’s business model? Does a steady paycheck offset DML’s restrictions on your career? Do you trust them to treat authors fairly? Let us know in the comments below! Have you point out that full-time salaried journalists typically surrender copyright in a similar way. Yes they’re underpaid and it can be sweatshoplike. ..but the benefits of being salaried really are a big plus. I would be concerned about Hollywood accounting practices though. Thanks for the writeup. To me it feels like Bruce Springsteen’s first recording deal – the one that his eventual lawyer (who broke it in court) described as ‘the worst deal anyone’s made since the Indians who sold Manhattan island. I applied with them – but after going through MONTHS of waiting after receiving an email that said the wait would only be “up to two weeks”, I find this more and more suspicious. I think they use the application to collect people’s ideas and then get cheap copy-writers to use those ideas. If they can’t even send out a generic email like “sorry, we are swamped – expect to wait three more months for a reply”, then what does that tell you about them as a company? Clearly not reliable. I wouldn’t say they are taking ideas during the initial application stage as they aren’t asking for specific ideas at that point however I was blocked from posting on their FB page (actually saying another poster had a point). My post and the other post were deleted and I was informed that I was no longer part of the application process (I was through to stage 2) because The Board did not think I was a good fit. It seems they are not looking for people who can think for themselves, or who voice their concerns. I wasn’t a good fit as I have serious concerns with the model, reinforced by this ‘punishment’ for speaking out and I would never agree to giving up my IP. I was informed during a lengthy phone conversation that authors will own the copyright on their ideas however, it’s my understanding, that if you own something, you don’t have to buy it back to use it. I will not list my concerns here, there are many, but needless to say, Author Beware. I am so glad ALLi that you tackled this issue. I’ve been searching for months for informative views on this but can only find people applauding the idea. I have been selected for the next stage but have some major concerns which have been addressed here. I did have a conversation with De Montfort lit (on FB/public) and it seems all contracts will be open for negotiation so having a clear head, knowing what you want/should have and which lines you won’t cross is essential. As yet though the feedback stage hasn’t even been completed which is a red flag for me because it possibly reveals a lack of motivation on De Montfort’s part. (There are going to be teething issues for sure, but will these be ironed out in due course?). I was shocked to hear the comment regarding monetising authors unapologetically. In an industry where many authors don’t earn back a small advance, this attitude raises concerns. I certainly don’t want to sell my writing soul for short term monetary gain but do feel, from what’s been discussed so far, that at the face to face interview stage there is room for negotiation. The issue isn’t applying or getting through, it will be ensuring authors have a clear head when negotiating, and the courage to walk away from any contract they aren’t happy with. Having discussions like this empowers writers and means they can make the best decisions for their careers. As an full time writer since 2014, and a self publisher of twelve about to be thirteen novels, I still consider myself a newbie. I write what I write because it’s fun and people like my stories. I also am adapting the series to the big screen. Yes I would love to be the next Andy Weir, Rowling, or Hugh Howey. Who wouldn’t, but I’m realistic enough, especially after reading their ‘road to success’ bios that my chances are better at winning the Powerball national lottery here in the states. My reviewers think my work is worthy of the silver screen. I think it might be. Here are the circular issues: Big five marketing and a closed film society. You need one to break into the other and visa versa. Mr. D.M. Lit has a very different way of looking at the writing business model. I’m all for that if he can join us Indie folk in breaking the strangle hold the big five have and I personally salute him if he can put a stop to the so called ‘partner’ or hybrid shams we see popping up in small and medium vanity presses. They will gladly do a POD service for you after you pay for the printing of inventory for certain distribution houses (Amazon, B and N, etc.) You get to pay them for that inventory and pay some of them a portion of each sale, after you pay the distributor. You might never recoup the print cost. These days if is self-publishing, but here are the partner packages you must purchase to qualify. The pay to play game has reached epidemic size. The value of the story, has taken a back seat to the phony editors, cover designers, and those who think the right margin must be justified to make it real literature. Contracts are good. As a former executive involved in million dollar deals, I know from experience a contract that is non-negotiable and still remains fair to the signee is as rare as unicorns. In closing, the important thing to remember in the learning curve in the writing profession comes down to marketing. I have not seen D’s model contract but seems the marketing strategy, as in a specific plan to sell the books, is smoke and mirrors. He wants all the rights because the Amazons, Netflix, Spike, BBC epic series producers take two years to get a show put together. Algorithms do not predict future emotions. They predict trends of spent emotions. Basic statistics tell us true probability curves are never 100%. Patterson is a good study. He subscribes to the novel a month policy. People like his work. But who are those peeps on the novel cover with him? People who would benefit from Mr. D’s idea, I’m guessing. Even If you are in dire straits and need a job, remember, the contractor’s written concessions must become part of the agreed conditions. Hand shake agreements stop at $500. Now how many wannabe authors know about contract law in G.B. or America? Maybe 10% would be my guess. And never use the contactor’s attorney. This offer is disingenuous. It’s like Ms. Fox asking if Foxy Jr. can babysit the chickens. Read the contract with a lawyer if you are confused with terminology. Mark out the onerous parts. Send it back and ask for the revisions to be put into a new contract. If Mr. D’s minions do not agree, you know the wolf is out of the sheep’s skin. Sorry for the animal analogies, but I am a writer who spent many years living in hotels around the world 28 weeks out of the given 52 and now I live a nice life on a horse farm. Best if luck Deborah. Looking for your feedback and hope it works to your advantage. Security versus freedom…the fact that they would own all of our rights sounds in some ways like a more complete hold than traditional big publishing houses held over its writers. This does frighten me. At the same time, they do offer a steady paycheck and a chance to work full time doing what we love…which is very tempting. My last nonfiction book was “You Don’t Want a Job.” I cannot imagine working full time for ANYONE, let alone doing work for hire as a writer. Not to mention that even as the most frugal family in America, ain’t no way we could live on $30,000US. Makes me sad to think any artist is so desperate they’d even consider such malevolent terms—or that any writer would be so wholly motivated by money they’d sell their work, lock, stock, name, and idea. This article mirrors my own suspicions from the initial announcements. Run far away. At best, if you dabble with something like this, try to use a pen name, or you may be stuck creating a pen name to use for the rest of your career to live down the potential damage to your reputation after X years in such a system. In terms of modern writing ateliers, like Patterson’s, at least the man demonstrably knows his market, adds his own expertise to the story outlines, and has a brand with significant value. While I don’t know the terms of his contracts, there is potential for those to make financial sense for some authors who are a good fit. If people were still looking for writers for Nancy Drew or the Hardy Boys books, the same would apply. But this offer isn’t restricted to an existing product with a successful brand, and it attempts to own the author in ways that are very alarming. If you’re going to take risks, and all publishing is a risk, better risks you control rather than risks you don’t. I’d rather devote my own modest efforts to growing my own business than devote my attention to the lottery of traditional publisher acceptance and the subsequent loss of control in hopes of “scoring the next big one.” This offer is even more restrictive in terms of control, and why would we expect that “chasing the market” in terms of “the next big concept” (50 shades of wizard schools, anyone?) will be more successful for him than for the trad publishers who already do that? It may feel less risky to take a guaranteed income (for some time) than to go into business for yourself, but all you’re doing is delegating that risk to an inexperienced 3rd party with no brand and losing all upside and control over your creative products. At least if you own your work, it’s yours and remains yours, and you can decide what to do with it as it accumulates. Meanwhile you’re free to publish it yourself these days and start earning money directly. Plus let me note: one of the canards against self-publishing is the notion that “you have to write a lot of books quickly to make more money”. Whether true or not, this offer makes that a central part of the deal. Just by looking at those contractual conditions, no, I would not trust this company. I am a self-published author making a living from writing and I have not spent ridiculous amounts of money on publicity. I’ve worked it up, read everything I could get my hands on and waited it out. I now have a literary agent for subsidiary rights who offer me a contract that is fair and I would have it no other way. I don’t want to be employed – that’s why I chose self-publishing. Unfortunately, it seems there are many, many published authors who see themselves as superior to independent authors and that’s fine, because at the end of the day, I earn my own salary, I control my own enterprise and above everything else, I decide what to do with my ideas; I can gift them, I can sell them or I can keep them. Personally, I feel it is the disillusioned author that would go for a company like this. Perhaps they have tried and failed to self-publish because they refuse to put in the hard work that marketing implies, or maybe they are published authors with abusive contracts, or good contracts but failed to sell enough books for the publishers to want to keep them on. Why would you want to hand everything over for a discreet but steady salary? What about the great ideas, the strokes of genius – you give everything you are for a paltry two thousand dollars a month? Not me!! mmmm……I was published by the time I was twenty-six and although it wasn’t novels but more picture and young readers I was pretty proud of myself for getting there. I was rejected a few times but the agent or publisher always took the time to come back to me with some encouragement. I was always told that I shouldn’t write for money but the love of the written word and they were right. I only received 10% royalties and by the third edition, I received 7%. To this day I have no idea what the costs were and wouldn’t have asked. My contract gave me copyright, yes but I still don’t have the right to publish it again without the express agreement of the publisher. So what is the difference here? Now when you send off your manuscript, you find a plethora of agents to choose, some who look like they have just graduated and a large number of publishers who hand over their slush pile to an intern. So what exactly is your point here? For the first time, writers are no longer at the bottom of a large money-making machine and I for one am very excited. Apart from the few exceptions and in most scenarios – luck or contacts, there doesn’t seem to be a lot of opportunities for writers. When you take away the literary snobbery from the industry, a publishing company unless you’re a charity, is like any other company and that’s making money. A writer writes to be read and how are we read if not published? As for the terms, Jonathan makes it quite clear that you should liaise with a lawyer. As for sweatshops, Patterson, to name one, has a number of writers working for him. Does he run a sweatshop? It’s about time that writers are recognised and supported and not ignored. As for ideas, what on earth is the problem with that? In any creative market, you are paid to come up with ideas. You are paid to brainstorm and it is the intellectual property of said company. De Montfort is also hiring the experience. I really think you should focus on supporting a company that has the guts to step out of the shadows of the big five. I’ve applied and chatted with him. I have no idea what my chances are but it’s better than trying to sell my soul to the many so-called experts out there and be part of an evolving enterprise. As for Inkitt, well I could have told you that wouldn’t work as you had to put your work online and whoever was the most popular got picked. No. Wait. They do that on Amazon already. Isn’t that called ‘Self-Publishing?’ I am more surprised that for someone who seems to promote self-publishing and is part of the Alliance of Independent Authors you would understand how difficult it is to promote your own book. As for genres, most of the publishers I know want what sells and will only be interested if that’s the case. You only have to look at manuscript wish list to see what publishers and agents want. Again, when you pull it down to the bare bones, it’s about selling a product and making a few coins from it. If vampires sell better than, How to repair your car,’ then it’s a no-brainer. Give them a chance and I will reply a little later about my experience if I’m one of the lucky few, if not then I tried and will continue on my way. Thanks for your feedback Deborah. John is in further conversation with the company and we will have more information soon. We’d love to have your feedback if you do get involved.